H.N. Lovatt Grocery & Confectionary Store, 9328 Jasper Avenue c. 1930. Photo courtesy of the City of Edmonton Archives EA-75-368. A bell jangles as the weathered door creaks open and the smells and memories flood back: being six years old, buying liquorice whips and penny candies and jawbreakers, a bottle of Coca-Cola for seven cents. When I was growing up, hardly a day went by that I didn’t visit the corner store. On allowance days, when I got a dollar or sometimes two, I would run to the store and buy a Pep Chew and a cream soda, and visit with the merchant. If the weather was fine, I would sit on the front step and savour the treats. Those days are pretty much gone – for me and for the corner store. As corporate convenience retailing has steamrolled into our lives, corner stores have virtually vanished. It’s sad, really, because independent little grocery stores were much more than mere places of commerce. They were where citizens gathered to chat over a soda from the cooler and to buy meat, produce and staple goods. They were focal points for communities. We used to shop at Sherbrooke Grocery and Wing’s Grocery, bookends on 127th Street at 121st Avenue. My father said the butcher at Sherbrooke Grocery had the best meat around. Wing’s father opened his store in 1950 and, for much of the next 50 years, Wing and his family still ran it. Local corner stores evolved from general stores of the late 1800s. Most were located on corners and along streetcar lines because that’s where the traffic was. They were also usually central to the community or area they served because many people didn’t have cars and most walked to get their groceries. 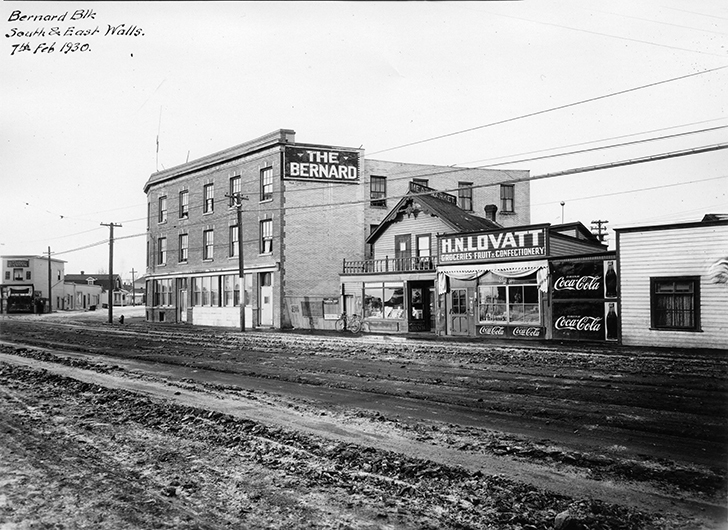 Ones that operated in Edmonton in the early 20th century had no consistent or specific architectural identity. They were merely small functional wood-framed buildings that were service-oriented – nothing flashy, just right to the point. Some of them lasted decades, like the little store on Jasper Avenue near 93rd Street, started by the Lovatt Brothers around 1900. The Lovatts operated the H.N. Lovatt General Store as a family. They lived next door, and watched a great many changes to the neighbourhood with the passage of time. H. Norman Lovatt operated the store into the 1950s. Lovatt’s Grocery, c. 1950. Photo courtesy of City of Edmonton Archives EA-10-2294. The designation provides $91,822 from the City to assist the owner with the cost of repairing the roof, stucco and wood cladding, windows and foundation. The building exterior will also be painted. Independently owned corner stores fell on difficult times during the Second World War. Food supplies dwindled and owners couldn’t get boys to deliver the groceries because most of the help had been enlisted. But then the boom returned in the 1950s, and for a time Edmonton boasted more than 100 corner stores operating as confectioneries and grocers. Some went upscale and installed ornate soda fountains and long counters with stools that swiveled. The arrival of supermarkets in the early 1960s spirited away a lot of the old faithful business. Then in the 1970s, 7-elevens and Mac’s stores came to town, bringing with them the end of an era. Independently owned corner stores that were not part of a chain and couldn’t compete on volume or brand familiarity toppled like dominoes. The building that houses West’s is one of the oldest in the Cromdale area, dating back to 1900. It was a grocery store for at least 70 years. The name comes from Mr. West who ran the store for many years including the Depression. Corner store operators were hardworking folks and, after years of dealing with an unpredictable public, they often cultivated hard-crusted personalities. They were characters. Lucas’ Confectionery & Grocery (The Tavern) October, 1934. Photo courtesy of the City of Edmonton Archives EA-160-937. When Top Louie opened his grocery store on Whyte Avenue at 108th Street in 1948, streetcars ran down the middle of the avenue and milk was sold in round glass bottles for 17 cents a quart. Louie ran Top’s Food Store for 31 years, until 1979. Like countless other operators, he got out when the margins became too precarious. And precarious is exactly the word to describe Midway Confectionary and Smokes, which operated out of a dilapidated building at 7925 99th Street. For years the ramshackle old wood-framed building seemed to be ready to topple over, presumably from the weight of the passage of time. Bulat was back at work the next day.